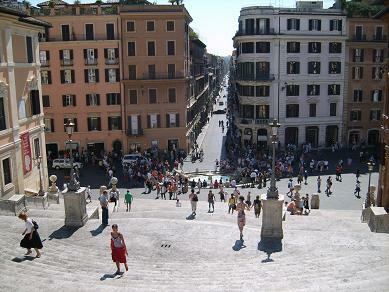 The Spanish Steps is a monumental stairway of 137 steps over several different flights. Above the steps stands the church ‘Trinita dei Monti’. This chuch has two bell towers. 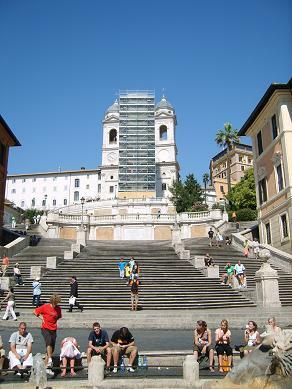 Below is Piazza di Spagna (Spanish square). On the Spanish Square is Fontana della Barcaccia. This fountain has the shape of a small boat. Nearby is the Trevi Fountain (5-10 minutes walking). The street starting at Piazza di Spagna is Via Condotti. Here you will find exclusive designshops from Christian Dior, Giorgio Armani, Prada, Gucci, Cartier and Bulgari. Guesthouse Relais Pierret stands right next to the Spanish Steps. The guest rooms are furnished wih parquet floors and antique furniture. Largest room is the Deluxe Suite with View (4 Adults). It takes two minutes walking to metro station Spagna. Behind church Trinita dei Monti is Villa Borghese. In this park is the famous ‘Galleria Borghese’. Metro station ‘Spagna’ is less then 100 meter from the church.